Pressure Canners - Just the Facts! - Canning Homemade! Home » »Unlabelled » Pressure Canners - Just the Facts! One of the most asked questions is "What pressure canner should I buy?" I wanted to report the information about the type of pressure canners that are available and the comparisons that I found in the manufacturers specifications. I want to make sure that there was first an understanding about a few basic features of a pressure canner that hold true for all of them. 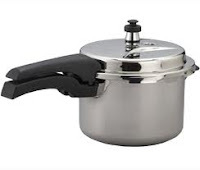 First, this is a canner and not a cooker. They are specifically built to withstand the type of canning that we are doing and have features that make it easy for a canner to do any safe recipe. A pressure cooker is a pot that has a single weight on the top that is set for 15 lbs of pressure. It looks like the pot at the right. Most of the recipes do not require this much pressure for canning and you will over cook your recipes and not get the quality product you desire. Second, all of the specification for the pressure canners are based on the fact that you will be using a regular mouth canning jar and not a wide mouth. I do know that you will lose the standard capacity in the pressure canner if you use a combination of wide and regular mouth jars. Please take that into consideration and don't freak out if you don't get full capacity when your canner arrives. The difference is that the weighted gauge measures only three different pounds of pressure, 5, 10, and 15. You can stack the weights on top of each other for additional poundage. Most canning recipes will show the proper amount of pounds for a dial versus a weighted gauge. For the dial gauge you will have to have it tested each year to make sure that the pressure is still accurately measured. Below is a chart which contains the research that I have done for three of the most popular brands available on the market. These can be found at a "few" retail locations but all are available online and a link below to a reasonable price site that I found. That price shown is without shipping and handling as some of the sites I looked at had free shipping for the more expensive brands. I would love comments following this post if you own one of these canners to help out the other readers in making a decision. Many of you know which one I use, but to be fair I want to be impartial and see what the feedback is on these products. larger canners have the ability to double stack. measure your dimensions before you select a canner. or plugs built into the canner. All-American is metal on metal and doesn't have a gasket. though I may not do it every time. those in quart size since I have so many mouths to feed. help other people make their choice. canners are not approved to work on ceramic or glass top stoves. Here is the research on glass and flat top stoves, "Flat Top & Glass Ranges - Is Canning ok?" It would be good to call your manufacturer to get more details if you have this kind of stove.